We have an exciting announcement; you could win a copy of Chalk Eagle. We’re hosting this give-away to celebrate National Storytelling Week (January 27th- February 3rd) and the publication of Chalk Eagle on the 29th of January. Chalk Eagle is a wordless picture book that explores the power of the imagination. It is filled with bold screen printed illustrations by Nazli Tahvili, and tells the tale of a boy who lives in the heart of a bustling city. He longs to escape the city and find adventure in the wild, which is a dream that comes true when he decides to draw his very own chalk eagle. The boy and the eagle fly around and have their own adventures. Proving that all we need to make our dreams of soaring away come true is a little bit of imagination. We believe that this message should be shared far and wide, which is why we want the children in your schools to take part in our project. Wordless picture books inspire creativity; when we lose the words we gain the opportunity to create our own narrative. They feed our imagination. We want your students to take the lead in making up their own story inspired by reading Chalk Eagle. Perhaps you will go through the book as a class, and then allow the children to think about their own responses. These responses can be in any format, from written stories, pictures, and even visual performances. Go where the wind takes you. All we ask is that you send us your creations, whatever they are. The ones which we think are the most exciting, inspiring and wonderful will be featured on our website. 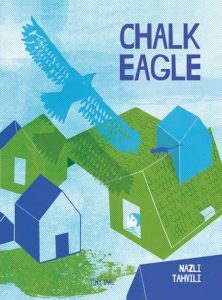 To have the chance to win a copy of Chalk Eagle please tweet us @TinyOwl_Books or send us an email at info@tinyowl.co.uk. This competition is only open for schools in the UK. Read Wordless picture books speak to all of us!